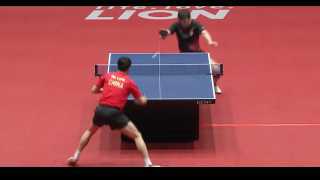 Crazy ball catch skill by Xu Xin! Outrageous wiggle by Simon Gauzy! Do you use Side Balancers? Pongfinity have a new video out. This time they captured the pros doing trickshots. Enjoy! Amazing trickshots from the wttc!!!! was looking round on youtube and found this AMAZING video WOW. Crazy skill by young Japanese kids! Sabine Winter plays Table Tennis on a tight rope! Insane Bottle Trickshot by PongIsLife! Insane Trick Shot Video Hits 26 Millions Views! When The Water Bottle Flip Challenge Meets Table Tennis! INSANE Under The Leg Around The Net Shots By Apolonia!